Healing is just the beginning as seniors looking for short-term assisted living care step through the doors of Prairie Meadows Alzheimer's Special Care Center in Omaha, NE. The rich furnishings of our living room are designed perfectly to help you slow down, relax and heal among friends. Our fitness classes can help you gain strength after a hospital stay and ready you for your homecoming. Our group of visiting therapists specializing in physical, occupational and speech therapy, and podiatry are here to ensure you have what you need to heal and recover as quickly as possible. 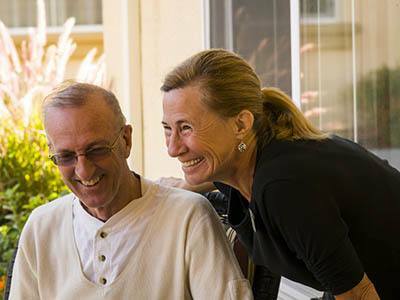 We also offer respite services for caregivers who are in need of a well-deserved rest from the demands of caring for a loved one with Alzheimer's. Regain your strength and sense of balance as we take care of your family member so you can better attend to his or her needs. Short-term assisted living and respite residents can choose from private or semi-private rooms and have access to the full range of amenities during their time with us. Surround yourself with nature as you enjoy our numerous outdoor areas or just relax over a cup of coffee and card game with good friends. At Prairie Meadows Alzheimer's Special Care Center the art of healing is right within our front doors.